Congratulations to Mr. Ciprian Voinea for a great career progression with the award winning Park Hotel, Vitznau, Lake Luzern, Switzerland. 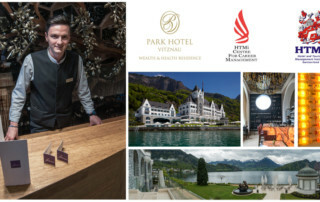 The Park Hotel Vitznau (http://www.parkhotel-vitznau.ch/en) represents a true jewel on the banks of Lake Lucerne. This historical property has been recently and extensively renovated, fully embracing the notion of preserving the past and shaping the future, while being characterised by three main themes: Wine & Dine, Art & Culture and the Health & Wealth. Out of the three themes, the wine and dine concept has been brought to a new level, meeting the highest expectation of Swiss quality and creativity through its two Michelin star awarded restaurant, FOCUS (http://restaurant-focus.ch/en/) and PRISMA (http://www.parkhotel-vitznau.ch/en/wine-dine/restaurant-prisma). PRISMA – awarded with one Michelin Star and 16 Gault Millau points – provides a unique atmospheric view all year round across the lake towards the mountains, while focus – awarded with two Michelin Star and 18 Gault Millau points – guides the guests into a trip around Switzerland spiced with the best local ingredients. Moreover, Chef Nenad Mlinarevic from the FOCUS restaurant has been awarded the Gault Millau Swiss chef of the year 2016, a really excellent achievement. We are very proud to share with you one of our HTMi graduates also contributes to the success of this amazing property. Mr. Ciprian Voinea graduated the BSc degree in 2014 and immediately afterwards he joined the F&B team at The Park Hotel Vitznau as Chef du Rang. After a recent visit by Mr. David Hailstones our Director of Operations, he shared his delighted and enthusiasm to work next to such a great team and also mentioned especially; the dedicated management which he is always learning from. The HTMi Career Centre would like to congratulate Ciprian for such a strong career start, and with his dedication we see him going very far. The HTMi Career Centre has the pleasure to offer some great updates for our Alumni. We are working hard to revamping the actual network and to encourage more the communication and collaboration process. First of all, we are proud to announce that the Alumni website, at www.myhtmi.ch, has been upgraded and relaunched. Please visit it and see all the projects we are currently developing and you will find out useful information! Even more, we care about our Alumni and their opinions, so do not hesitate to write us for improvements and suggestions. Did you know about the HTMi Alumni Reunions? 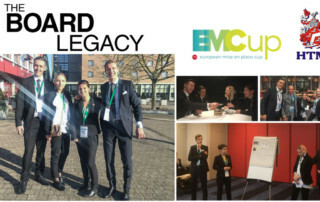 We have just organised the first three gatherings in Singapore, Bucharest and Budapest with the aim to facilitate the meeting and networking between the current and future Alumni. It is a new project, but with your support and with the increasing number of HTMi students and Alumni worldwide, for sure it will start growing. Moreover, in order to facilitate these reunions, as well as main pillars of this project, HTMi is looking for Alumni Presidents in different regions of the world. Are you interested? – visit the website and write us at alumni@htmi.ch for further information. Last but not least, stay connected with the HTMi Career Centre and all the HTMi Alumni on Facebook, LinkedIn, or just email us! Also, please do not forget to check the new volume of the HTMi Insider for the latest news from Sörenberg and all over the world. The HTMi Career Centre wishes to share yet another success story from our graduate students. After joining HTMi as a direct entry Higher Diploma in 2015, Aeikansh completed a first internship in F&B in Geneva and returned to complete his BSc semester. During this time, he earned a first class for his research papers and second-class honours, upper division BSc degree, which shows his high commitment and personal drive for success. Furthermore, Aeikansh has developed a passion for Finance and Revenue Management and he really wanted to pursue his career in this field. 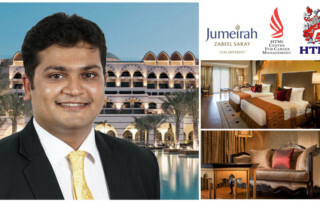 He is currently working as a Revenue Management Trainee with the Jumeirah Zabeel Saray on the famous Palm. We would like to congratulate Aeikansh to this exciting challenge and new role in the Middle East. This will definitely be a valuable experience and add to his career portfolio. It also allows him to pursue his dream to continue his career in the Revenue Management field and develop further his analytical skills. The Career Centre is very proud yet again to share more and more student Internship and Graduate news each week. Best regards from all the HTMi team. Congratulations to Ms. Iulia, Lilli & Anett! Best regards from all the HTMi teams. Join HTMi at the Swiss Education Fair in March. 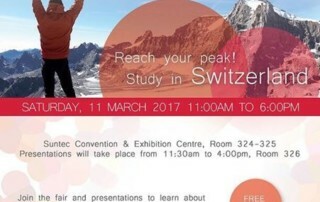 Come on down and join us at Suntec for the Swiss Education Fair in March! Find out more about our courses available in HTMi, where Switzerland is not only famous for its scenic beauty but for the hospitality courses as well! See you there! The HTMi Career Centre announces the Recruitment Week for the Spring Semester 2017. The Recruitment Week represents a very important event for the Centre for Career Management, where recruiters from all over the world are invited to visit the HTMi campus in Sörenberg Switzerland, to meet and conduct face to face interviews with potential internship or full-time students. It has been a huge success in the past years, with many opportunities being offered worldwide. 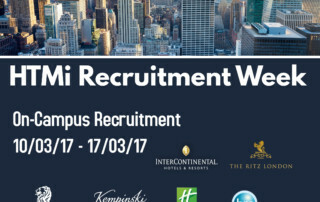 This semester the Recruitment Week will take place from 10th till 17th of March and prestigious hotel companies such as The Ritz-Carlton, Intercontinental Hotels and Resorts or Holiday Inn there are already confirmed. 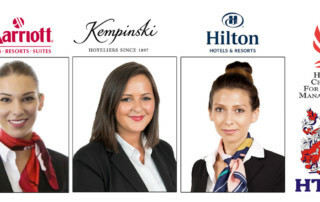 We are looking forward to offer the HTMi students and invited hotels an interesting networking possibility and a great success when selecting their candidates.